Let me tell you I am feeling the burn! My arms have officially taken up arms against me. At least, that's what it feels like. This of course is the result of my first two exercise sessions of the year (and indeed the first in a couple of months) that I so valiantly embarked on earlier this week. Don't get me wrong, normally I *like* feeling the burn. Odd? Perhaps, but it gives me a strange satisfaction and of course also warrants me having a smug smile on my face for a few days. But this? This is insanity! Pesto Pasta Salad is one of those firm favourites that is easy to whip up and darn tasty to boot. But I think it could do with a little makeover for 2010. What do you think? 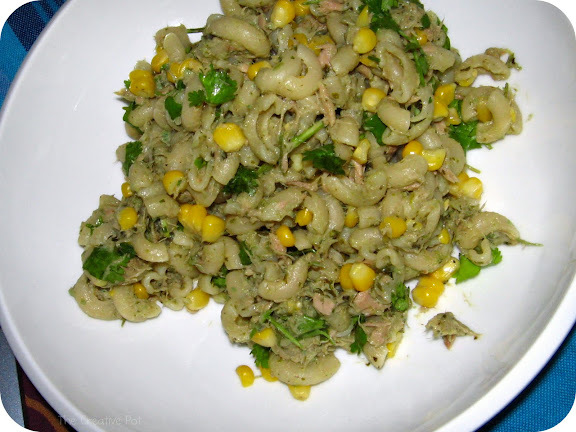 It's still pasta, still quick and super easy to make, but the normal basil pesto has been substituted with coriander pesto and I've chosen tuna and sweetcorn to pair up with the flavours. The end result is superb, if I do say so myself. Do add the fresh coriander at the end as well - it really brightens up the meal and just adds that extra layer of flavour that'll keep you going back for more. 1. Cook pasta in a big pot of salted water until al dente. Drain pasta and allow to cool slightly. 2. Add tuna, sweetcorn, pesto and yoghurt. Mix well and add salt and pepper to taste. Lastly, add the chopped coriander, toss lightly to combine and serve immediately. *Can be substituted with a tin of drained sweetcorn kernels. Note: Keeps for a few days in the fridge, but you will need to add a little water to loosen the pasta before serving.